Okay, I have fallen behind on blogging. That’s because I’ve been busy. Busy, you say? First things, first here are a couple of tititaling tidbits from the last couple of days. I’ve just finished Ordained to Be a Jew. Usually, I’m not so sluggish when it comes to reading a novel but I must say, the first of the book was tough. It felt a bit like a autobiography, while the second half of the book felt more like a memoir, really juicy stuff. I especially liked how well he was able to discuss his connection to Judaism and his struggles on the way. I noticed that my writing style is certainly a bit different. Much more emotional and madcap, I suppose. I can churn out a short story of about 5,000 words in a day or less if the topic moves me. I guess that’s about a chapter. 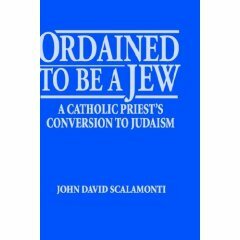 Also, my path to Judaism was a bit more winding and unlike John, I know a hell of a lot more about Santeria than I do about Catholicism. And though I’ve wanted to convert since I was 12, I didn’t convert until I was 26. I’ve only been a Jew for a year and living as a Jew for two. There are definitely some tales of adventures and misadventures there. I would like to discuss the multicultural aspect of converting if I were writing a book. Friday, two of my converting friends, one is a dark Dominican woman and the other a Chinese woman, were stopped at the front desk what they were doing at the shul. When they explained, the guard asked, “No, really.” I’ll be sending a letter to Rabbi Weinstock, of course. Meanwhile two days ago I went shopping for my Jew ‘fro as my usual beret beanie was holding on quite precariously to my head. I went into a store and I figured while I was there, I’d try on some clothing. Then I spotted the hats. Ohhh. When you have hair as big as mine, you don’t pass up the opportunity to try on a hat. It could be a perfect fit. Or more likely, it won’t even cover half my head. What can you do? Okay, these semi-Rastafarrian hats were just aching for me to take them hope. So I changed into them the way I used to change into my gym clothes in high school. In high school, I had mastered the art of taking off my clothes and hanging into my gym clothes without ever being naked in front of my nosy friends. When the Muslim woman saw my desperate attempts to recreate my childhood by changing hats while still wearing a hat, she let me into the dressing room nearest the door. Of course, I thanked her profusely. It was interfaith dialogue or anything but it was a nice little experience.